Time to wrap up Bacon Week here at pFoody. I have already shared some of my favorite bacon prepared foods, I thought it was time to share my favorite place to buy bacon. 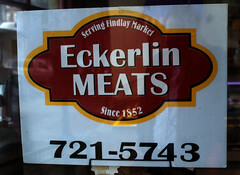 Eckerlin Meats is located at Findlay Market and has been around since 1852. They are located on the North side of the market near the North parking lot. They have been my favorite butcher for a long time. I first became familiar with Vosges Haut-Chocolat because of their exotic truffles. I think we saw them featured on Food Network, and my wife was intrigued. Since that time, I have become a regular customer. I was intrigued when they came out with the Bacon Bar, and had to give it a try.